Changes can be stressful. Things happen for both good and bad reasons and much of the change is beyond our control. We can adjust to the amount of stress we experience during change if we learn how to manage change. When we are in difficult situations, the consequences may include a decreased ability to function efficiently and we may become disheartened and, sometimes, we come to a crossroad of new opportunities. • Keep a positive attitude as your attitude is an important part of making the best of any situation. • Stay as optimistic as you can and keep in mind that you may not be able to control the changes in your life but you do know how to control your attitude towards changes. • Recognize your inner fears and find ways to adapt your life consequently. • Take care of your health even if you don't feel like. Go out and meet people who can help you maintain a positive attitude. • Set goals for positive results by focussing on the future. Develop strategies to cope with your challenges. 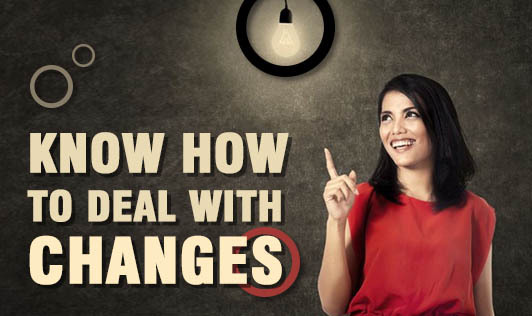 Accepting changes with a positive attitude is the best tool one can use to promote positive changes!